Marc Marquez made it nine wins in nine races at the Sachsenring on Sunday, despite having to start the race from pit lane. 20 minutes before the race rain began to fall, meaning the majority of the field took to the grid on their wet bikes. Stefan Bradl was the only notable exception, who switched to dry tyres before the warm up lap. The majority of the rest of the field dived in to pit lane to swap to their dry bikes at the end of the warm up lap, which meant they had to start from pit lane. Bradl started from the grid, followed by a handful of other riders from the back of the grid. 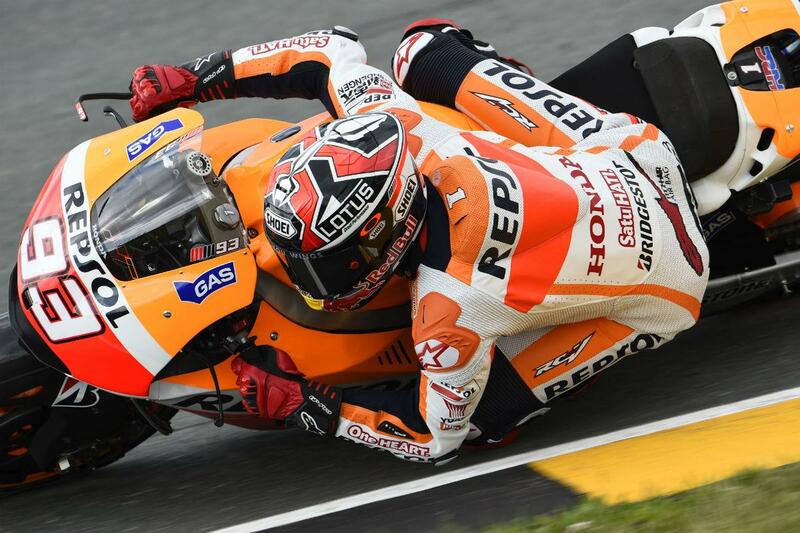 Marquez got a good start from the crowded pit lane exit and within a handful of laps had passed Bradl for the lead, taking team-mate Dani Pedrosa with him. Pedrosa was able to get the gap to Marquez down to under half a second just after the half way point, but Marquez responded with a couple of fast laps of his own to ease to victory. Jorge Lorenzo finished a distant third, 10 seconds behind Marquez, with team-mate Valentino Rossi further nine seconds back. Bradl's gamble didn't pay off in the end, the German rider was unable to keep pace with the riders who had started from pit lane and he eventually finished outside the points in 16th. Cal Crutchlow - another trider who started from pit lane - rode a strong race to finish 10th ahead of fellow Brit Scott Redding in 11th. Bradley Smith crashed again in the race, but remounted to finish 19th.